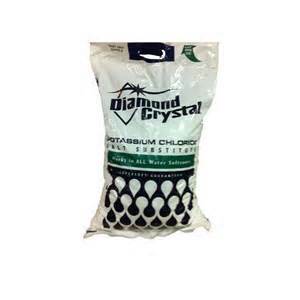 Why do some people use potassium chloride rather than salt to regenerate their water softener? The main reason is to avoid using sodium–for health or environmental reasons. In fact, some cities require its use in an effort to limit sodium levels in wastewater. How does the cost compare with standard softener salt? Potassium chloride (KCl) is more expensive, considerably more expensive in some areas. Also, salt is more readily available. Since potassium is used in farm fertilizer, it’s in much shorter supply and it may eventually get very expensive. I’ve heard you have to use more potassium chloride than standard softener salt to regenerate the softener. Is this true? In theory, it would seem to be true, but research has shown that this isn’t a big factor. In one study, when using 15 lbs. of salt per cubic foot of resin for regeneration, standard salt was only about 2% more efficient than potassium chloride. Are there problems with potassium chloride? Other than the cost and in some areas the lack of availability, one issue is the tendency under certain conditions (mainly temperature swings when softeners are installed in unheated areas) for a condition called recrystallization to occur. This is similar to the condition called “salt bridge,” with regular salt, but when temperatures fluctuate potassium chloride can precipitate and drop to the bottom of the brine tank forming a solid mass beneath the salt grid platform. There are strategies to alleviate this which include insulating the brine tank or elevating the tank on a wooden platform. I have a reverse osmosis drinking water system. They told me it takes the sodium out of my softened water. Is this true? Yes. It will also remove potassium, so if you have an RO unit for drinking water, your choice of a regenerant has no health implications. And if I don’t have an RO unit? The amount of sodium you ingest in softened water is pretty insignificant when compared with your total sodium intake, so drinking softened water normally isn’t important. For people trying to eliminate all sources of sodium, of course, it may be a different story. 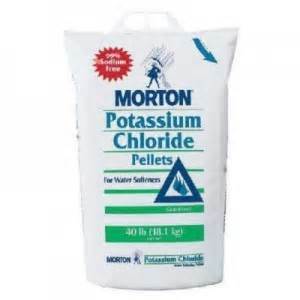 If I want to try potassium chloride in my softener, do I need to make modifications? No, salt and potassium chloride both work well in standard water softeners.